Chaos in the Storm was a year long thesis project from senior year of undergrad. In this project, I explored the role of chaos in art and life. In art, often times projects emerge from personal experiences, but the translation or interpretation into a piece can be quite challenging. I sought to explore this process (of translation and interpretation) in relation to representing chaos in my art practice based on a real personal experience. I worked from the definition of chaos as "complete disorder and confusion". After extensive exploration and research of chaos in art, I landed on creating an immersive installation that contained significant elements from my personal experience. I discovered through my art practice that each decision or action was in some part deliberate or planned - making it quite difficult to actually re-create chaos. The final installation was a transition from initially creating chaos in art to the representation of a chaotic moment. The entire installation is centered around a image of the home I grew up in, the source of my chaotic experience for the art piece. 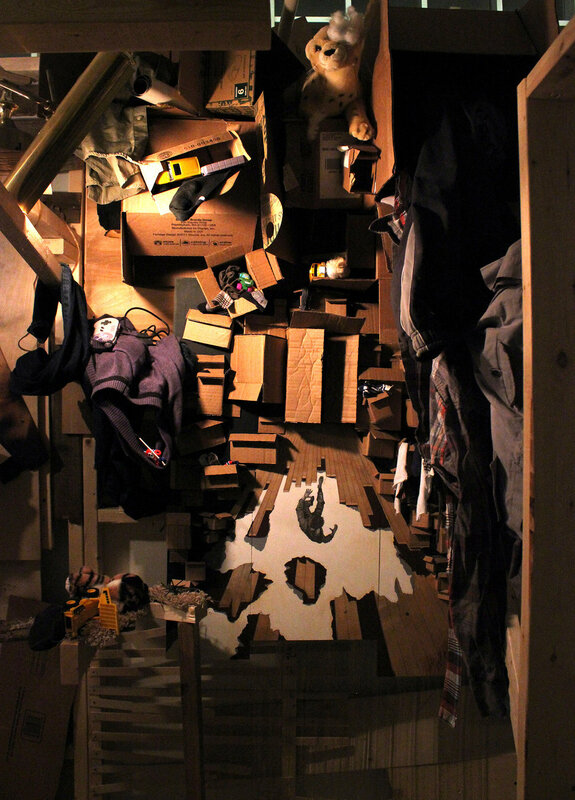 Scattered throughout are elements of the home such as sheet rock, plants, boxes, light bulbs, clothing, framing and dryer vents that serve to place the viewer in the chaotic moment. This piece was 12 feet long, 6 feet deep and 8 feet tall. Multiple forms of fine art were utilized in the creation such as photography, screen printing, drawing, mixed media and sculpture. A merge of the hallway and attic. Storage of personal belongings of those lost is too much to bear. Falls through the hole in the hallway floor.